Happy Hump Day everyone! Hope your day was fab! I had a great day and got a ton done! I have so many clients traveling this week that I didn’t have any sessions until late afternoon which was actually really nice and made for a super productive morning. 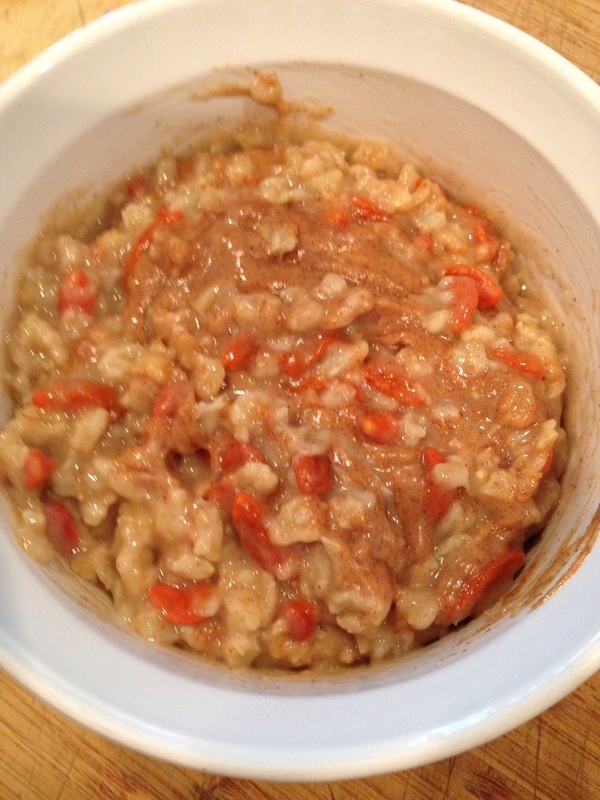 First thing, coffee and emails and then made this delicious Goji Berry Oatmeal. I cooked the Goji Berries in the pot with the oatmeal for about the last 5 minutes which softens & sweetened them up a good bit. Of course, there was cinnamon and I stirred in a teaspoon of creamy, (unsalted) organic, almond butter. (Trader Joe’s Brand) SO GOOD! Started some much needed loads of laundry after brek. With all my traveling the last couple weeks, the laundry had really started to pile up! Washed a ton of clothes and my sheets! Nothing like getting into fresh sheets at the end of the day. Something silly I started to do earlier this year…I wash my sheets in Dreft, Baby Detergent and now its the only thing I’ll wash them in! It makes your sheets so soft & I just love the powdery fresh smell. Ahhh 🙂 Believe me, try it! Another little note about laundry (don’t know why, but I actually do love doing laundry…nerd). 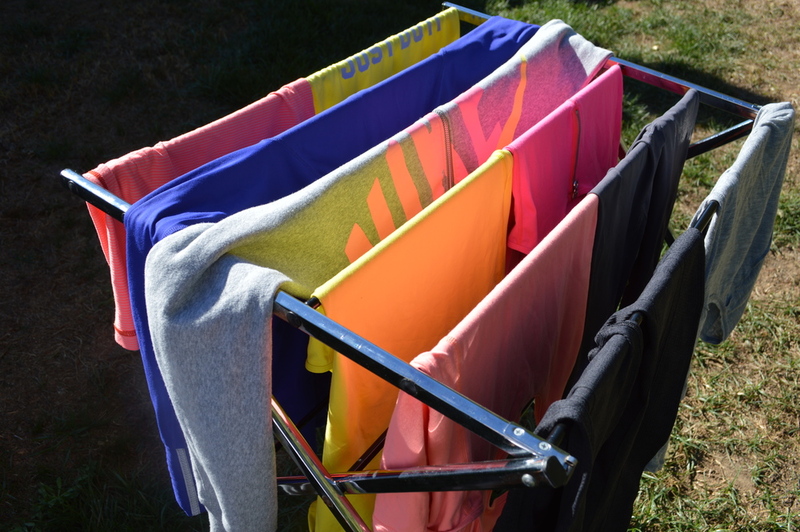 I wash pretty much all my LuluLemon gear and delicates in a laundry bag & hang my clothes outside to dry. The laundry bag really preserves your clothes and prevents them from being twisted, stretched and lose their shape. Today’s sunny & breezy weather couldn’t have been a more perfect day to hang dry my clothes outside! Nothing like fresh air! I think I get this from my Oma…my grandparents in Austria didn’t even have a dryer so everything got hung out to dry. Out of nowhere, my boxing coach text me last minute to see if we could squeeze in our boxing/yoga trade so I pretty much dropped what I was doing, changed clothes and ran out the door. We had been trying to match up our schedules to do our little barter but didn’t think it was going to happen this week but luckily, he had a client cancel so we got it in! yayyyy I quickly ate an apple and some dried apricots before running out the door…not exactly the most substantial pre-boxing snack but I didn’t want to feel like I was going to throw up during our sesh. Quickly ran home after my workout to shower, eat and pack a bag to take with me so I could go straight to yoga from work. kale/spinach (handful each), cinnamon, banana, frozen mango, 2 slices pineapple, scoop ground flaxseed, splash of almond milk just to add a little creaminess, water & ice. 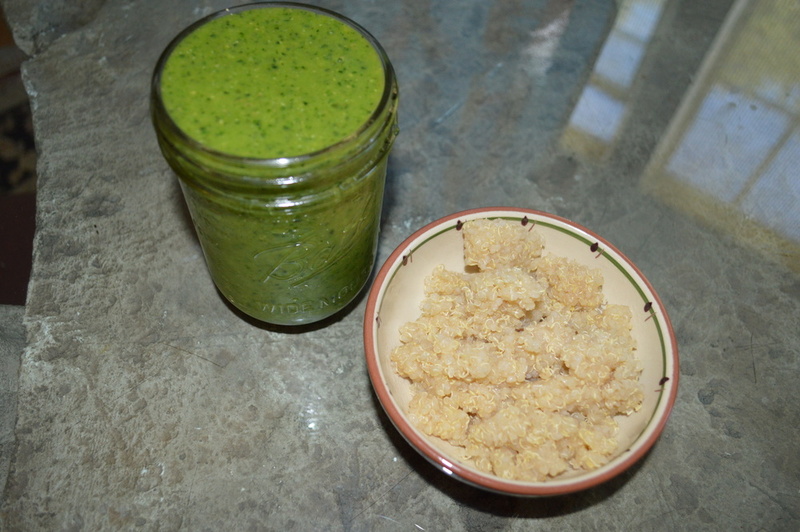 Side of quinoa for some healthy carbs & protein. Yoga was amazing tonight… I think I say this after every class! Since I’ve been gone so much, Its been weeks since I’ve had the chance to practice at Y2 and I could not have been happier to get on my mat. As always, Tanner led an awesome class. Child’s Pose, music on and this is the first song I hear = happy girl & big smile to myself. I don’t have a clue why but Men At Work – Down Under is one of my all time favorite songs & this mashup of it, along with Bon Iver’s – Towers, literally gives me goosebumps. Just one of those things… Enjoy! 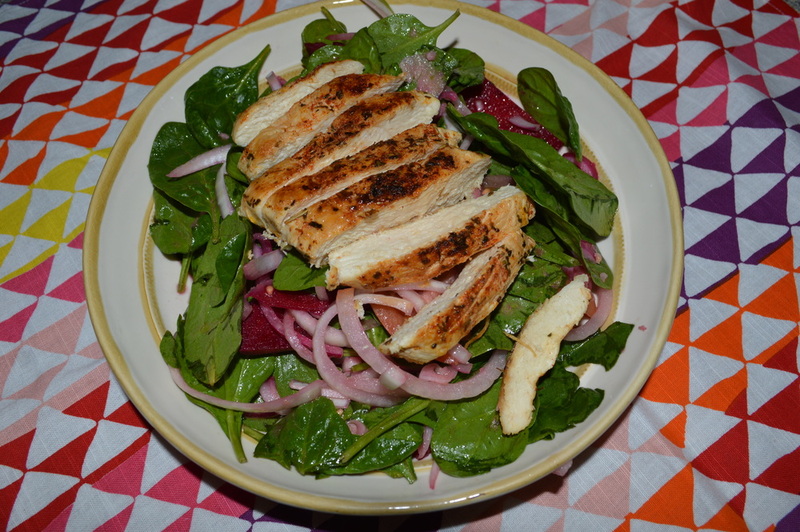 Spinach Salad with red onions, raw beets, tomatoes & chicken breast (made in the pan with olive oil) Had a few slices of pineapple afterwards for something sweet. Next Post Feels Good To Be Home!